This item cannot ship to certain locations outside the United States. 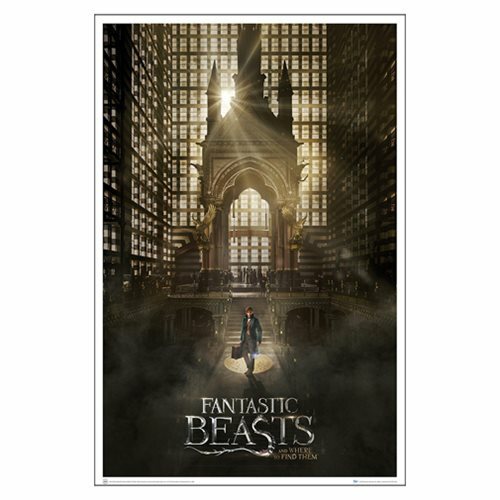 From the 2016 fantasy adventure Fantastic Beasts and Where to Find Them comes the amazing Fantastic Beasts and Where to Find Them Magical Congress Art Print! We are proud to bring you this design as a museum-quality art print on 100 lb. aqueous-coated, satin-finish paper. This one-sheet size print features magizoologist Newt Scamander arriving at the Magical Congress of the United State of America, the secretive American counterpart of the Ministry of Magic. MACUSA is located in the Woolworth Building in New York City. Fantastic Beasts and Where to Find Them is a 2016 fantasy adventure that returns us to the wizarding world created by J.K. Rowling. The movie opens in 1926 - 70 years before Harry Potter attended Hogwarts School of Witchcraft and Wizardry. Newt Scamander has just completed a global excursion to find and document an extraordinary array of magical creatures. He is in New York for a brief stopover, but is waylaid by a no-maj (American for muggle) named Jacob, a misplaced magical case and the escape of some of Newt's fantastic beasts. 27-inches wide x 40-inches high.
" I just wanted to tell you that you are the best !!!!! " " I just wanted to tell you that you are the best !!!!!..."